Not since 1988 -- the last time a Stateside appointment broke the "40 Barrier" -- has an American prelate been called to the high-hat as young as San Antonio's new auxiliary, 41 year-old Bishop-elect Oscar Cantu, who'll be ordained at a Mass tonight that, by popular demand, has been moved from San Fernando Cathedral to one of Alamoland's larger parish churches. But even so, admission's still ticket-only. A quatrilingual dogmatic theologian still working to complete his Roman doctorate, the native Houstonian -- whose 14 years of priesthood have found him in a mix of pastoral, administrative, formation and education work -- has been an intensely-sought episcopal prospect around the country, reportedly topping multiple shortlists for open auxiliary berths before getting snapped up by the nation's senior Hispanic prelate, San Antone Archbishop Jose Gomez. Home to 675,000 Catholics, Cantu's new scene in Texas' senior archdiocese is a bit more settled than the Boomtown-style expansion in the 1.5 million-member H-Town church, but the new auxiliary won't lack for familiar faces, first of all a family friend from before he was born, now retired Archbishop Patrick Flores. Tonight's ordination caps a weekend that began with the ordination of 23 permanent deacons for the archdiocese; having ordained three new priests last month, the city's Assumption Seminary's said to be looking at an entering class of close to 30 for the fall. He built a reputation as an approachable church leader who was always late but delivered sermons his parishioners could relate to. There was pride in the congregation that the self-described “snot-nosed kid” from the neighborhood did not forget where he came from. He helped campaign against a city-sponsored development that did not include affordable housing. Cantú's effort paid off. As part of that project, the city pledged $2 million for lower income housing. His energy was infectious. More volunteers showed up for church functions and to help with the school. At his last sermon in late May, Cantú told parishioners he learned how to be a priest sitting at his family's table. Cantú's studies have focused on the sacred traditions of the church and he believes that there is more to eating together than simply sharing food and company. When he becomes a bishop, Cantú will have his own coat of arms, a tradition for those becoming bishops. At its center Cantú chose to have a table. For him it represented the church altar and the family dining table. He described to his congregation how his parents presided over the table with eight kids and their friends. Somehow, there was enough food, and guests were always welcome. From his father he learned the importance of honesty. As Cantú walked down the aisle of Holy Name Church for the last time as its priest, he passed his family, friends and neighbors. With some holding back tears, they stood and the church filled with applause. He had finished his sermon asking for their prayers as he moved on to the challenges that were ahead. In San Antonio, sitting in his office across the hall from the office Cantú would soon occupy, Gomez smiled. Cantu's age is historic in another regard: he's about to become the first US bishop born following the close of the Second Vatican Council. 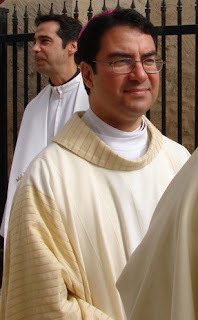 As noted above, no Stateside appointee younger than 40 has been seen since 38 year-old Roberto Gonzalez OFM was named an auxiliary bishop of Boston in 1988; Gonzalez serves today as archbishop of San Juan on Puerto Rico. Since that time, while the handful of US bishops named in their fifth decade have been aged 43 or over at the time of their appointments, the age of the bench's youngest member has fallen a full seven years (from 48 to, now, 41) since B16's election. Given that trajectory, could another surge through the "40 Barrier" be far behind? From Spurs Country, the Festival Express has two more stops in its 17-day, eight-city circuit: Thursday's ordination of Bishop-elect Tony Taylor in Little Rock, and Friday's installation of Archbishop-elect Thomas Rodi in Mobile. With several more moves expected to drop before the Vatican's traditional summer recess, the next major slate of Stateside appointments are currently looking on-target for movement in the days following the USCCB's Spring Plenary late next week in Orlando.